When the Church of South India (CSI) was inaugurated on 27th September 1947, it was acclaimed as the most significant event in the Church Union movement, because for the first time after centuries of historic divisions, churches with Episcopal and non­ Episcopal ministries were brought together in a united Episcopal church. Four different church traditions had been brought together in the CSI, Anglican (Episcopal), Congregational, Presbyterian and Methodist. All these churches had been established in India through the missionary work of churches in Europe, America and Australia, who had started their work in India at different periods from the beginning of the eighteenth century. The Anglican Church was established through the work of the Church Missionary Society (CMS) and the Society for the Propagation of the Gospel (SPG), both closely linked with the Church of England. The congregational churches were esta­blished through the missionary activities of the London Missionary with missionaries from Great Britain and Australia, and the American Board of Commissioners of foreign Missions (ABCFM) ). The Presbyterian Churches through the work of the Church of Scotland Mission, the Dutch Reformed Church in America and the Basel Mission in Switzerland and Germany. They also had Connections with the Presbyterian Churches in England and Australia. The Methodist Church was established by the Methodist Missionary Society of the Methodist Church in Great Biitain. With the growth of nationalism during the latter part of the 19th century, there developed among Indian Christians also a concern for self-reliance and independence. There was further the growing awareness that the divisions among the churches in India were not the making of Christians in India, but brought by the different missions from abroad. Several efforts were made to bring about a united, indigenous Christian church in India free from dependence on denominational links with churches in the west. None of these had lasting results. However, faced with the challenge of the mission frontier and the necessity of better credibility, the churches themselves began to be increasingly aware of the scandal of disunity and sought ways of overcoming it. As a result, different kinds of mergers or unions among churches were beginning to take place. In October 1901, a Federal Union took place between the Presbyterian missions in South India, the United Free Church of Scotland Mission, the American Arcot Mission of the American Dutch Reformed Church and the Base] Mission. In 1904, the Congregational churches of the London Missionary Society in South India and the Congregational churches of the American Board Missions in South India and Jaffna came together in a Federal Union. In 1908, these two bodies, the Presbyterian and the Congregational, came together to form the South India United Church (S.I.U. C.). Following the International Missionary Conference held at Edinburgh in 1910, there was even greater impetus for co operation and union among churches. One of the direct conse­quences in India of the Edinburgh Conference was the formation of the National Missionary Council in 1914, (Which later became the National Christian Council of Churches). The National Missionary Council organized Regional Christian Councils. One of the objectives of the Regional Christian Councils was the strengthening of the evangelistic outreach as a joint or co­operative activity of all the churches. The experience of such joint evangelistic programs of the Madras Regional Council led the churches to raise the question afresh as to whether there was any valid reason for the churches to remain divided when they had the same Gospel of Jesus Christ to proclaim in their evangelistic mission. As a result of this realization, an informal meeting of pastors of the Lutheran, Methodist, South India Uni­ted Church, and Anglican churches convened by the Rev. V.S. Azariah (later Bishop of Dornakal) and the Rev. V. Santiago took place at Tranquebar. This conference issued a call for union among the churches and a Joint Committee was set up for considering negotiations for union The Lutherans did not join this committee and only the other churches, the Anglicans, the Methodists, and the SIUC participated in the negotiations, which followed. The first meeting of this committee was held in 1920 and following it many meetings were held to consider different issues, until the churches could agree on a common basis for union. Quite early in the negotiations it was agreed that the Lambeth Quadrilateral could be a satisfactory basis for the union of the churches. This meant that the four basic principles would be: (1) the Holy Scriptures of the Old and New Testament as containing all things necessary to salvation and as the supreme and decisive standard of faith; (2) the two creeds, the Apostles' Creed and the Nicene Creed as witnessing to and safeguarding this faith; (3) the two Sacraments of Baptism and the Lord's Supper, and (4) the ordained ministry with the historic episcopate. The first three could be accepted without any controversial question. But the fourth became problematic because of the fact that while the Anglican Church had the historic episcopate, and all its ministers were ordained by the Episcopal laying on of hands, the other churches in the negotiations did not have an Episcopalian ordained ministry. Finally, an agreement was reached that in so far as God had blessed all the ministries with undistinguishing regard, all who were already ordained in any of the uniting churches would be received as ministers in the United Church and that all new ordinations would be by Episcopal laying on of hands. It took about 20 years to reach the agreement. It took a few more years for the churches to take their formal decisions accepting the scheme of union. The Methodists gave their vote in 1941. 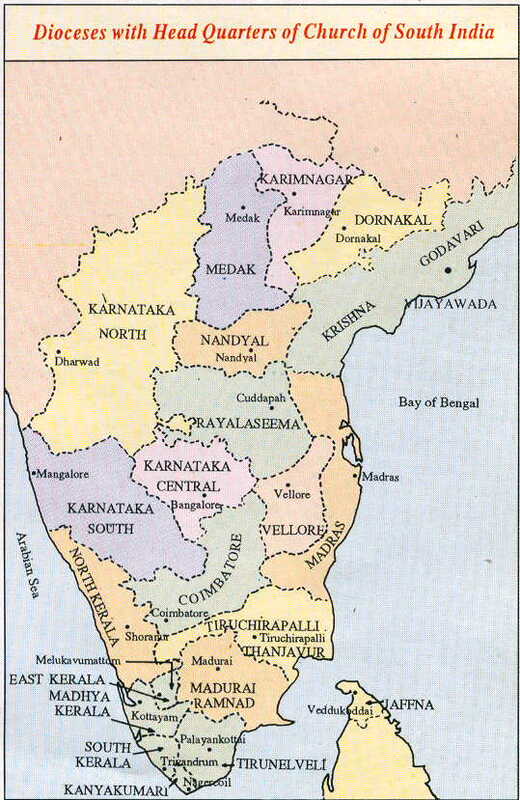 In 1945, the General Council of the Church of India, Burma and Ceylon (the Anglican Church) gave their consent for the four Anglican dioceses in South India to go into the union. In 1946, the General Assembly of the South India United Church decided to accept the scheme. These decisions made it possible for the Church of South India to be inaugurated on 27th September 1947. At the time of inauguration the total membership of the CSI was a little over one million, made up as follows: Methodists 220,000, SIUC 290,000, and Anglicans 500,000. At present the total membership is over 1,500,000. The CSI practices infant baptism for children born in Christian homes. For others, believers' (or adult) baptism is given. Baptized children are members of the church and share in the privileges and obligations of membership so far as they are capable of doing so. The full privileges and obligations belong to those who, after attaining to years of discretion, receive confirmation of their baptism. Normally, members are confirmed by the laying on of hands by a bishop. Confirmation may also be given by a presbyter authorized to do so. The ordained ministry of the church conforms to the traditional pattern of the threefold ministry of bishops, presbyters and deacons. At the beginning only men could be ordained to the ministry. But the consideration of the role of women in the ministry has led the church to decide in favour of ordaining women also. In 1960 it was decided to admit women for ordination as deacons. From 1982, ordination to the presbyterate is also possible for women. Each diocese has a bishop. A Diocesan Council, consisting of all presbyters in active service and lay representatives of congregations and presided over by the bishop, forms the policy making body for the whole church and meets once in two years. The presiding Bishop of the Synod is called the Moderator and is elected normally to hold office for two years. He is the administrative head of the CSI. The headquarters of the Church is located at Madras where there is a Synod office. (1) Ministerial Committee: which deals with issues relating to the ordained ministry. (ii) Theological Commission: which deals with questions relating to the faith of the Church. (iii) Liturgy Committee: for advising the Church on matters relating to worship and orders of service for different occasions. (iv) Board of Mission and Evangelism: for promoting missionary outreach both within the CSI area and outside. (v) Union Negotiations Committee: for negotiations with other churches towards wider union. (vi) Commission on Political Questions: for considering issues of justice and peace from the perspective of the Church's witness to the Gospel. Soon after the inauguration of the CSI, a religious Order for Women was organized under the leadership and initiative of Sister Carol Graham who had been a deaconess of the Anglican Church before Church Union. The Order of Women has both active members and associate members. The active members take a vow of celibacy and are committed to observe a rule of life and are engaged in some form of full time Christian service. In order to promote the participation of women in the life and mission of the Church, a volunteer Women's Fellowship has been organized. For both the Women's Order and the Women's Fellowship, Vishranti Nilayam at Bangalore is the Headquarters. The Church of South India supports five theological colleges in South India, the United Theological College, Bangalore, Andhra Christian Theological College in Secunderabad, Tamilnadu Theological Seminary at Madurai, Kerala United Theological College at Trivandrum and the Karnataka Theological College at Mangalore. Candidates for the ministry are normally trained in one or other of these theological colleges. Apart from the evangelistic work of the different dioceses within their own respective areas, some dioceses also have missionary outreach in the areas of other dioceses. The Indian Missionary Society, organised by the members of the Tirunelveli Diocese, continues to work in Dornakal Diocese among tribals, Hindus and Moslems. South Kerala Diocese is supporting a missionary in Nirmal Mission in Medak Diocese. The Madurai Ramnad Diocese also is participating in this mission. It has also opened another mission field at Etturnagararn in Karimnagar Diocese. The Madhya Kerala Diocesan Youth Fellowship has missionary work in the Parkal area of Andhra Pradesh. The CSI also has an overseas missionary programme. The first missionaries under the Synod auspices were sent to Papua. The Rev. and Mrs. Satya Joseph were the first CSI missionaries to Papua. When the continuance of this mission was prevented by legal impediments imposed by Australia, it was decided to send missionaries to Thailand to work in co-operation with the United Church of Christ in Thailand. The Rev. and Mrs. Paul Manickam were sent as the CSI missionaries. After the death of the Rev. Paul Manickam, Mrs. Manickam is continuing as a CSI missionary. Even though each of the uniting churches ceased to exist, the experience has been one of death and resurrection to a life greatly enriched through the Union. According to the Governing Principles, "For the perfecting of the life of the whole body, the Church of South India needs the heritage of each of the uniting churches, and each of those churches will, it is hoped, not lose the continuity of its own life but preserve that life enriched by the union with itself of the other two churches. The Church of South India is thus formed by a combination of different elements, each bringing its contribution to the whole, and not by the absorption of any one by any other. It is therefore, a comprehensive church". The Church of South India has in its life sought to preserve whatever was regarded as valuable for the Universal Church in the Anglican, Congregational, Presbyterian and Methodist traditions. It is also the intention of the Church of South India to conserve all that is of spiritual value in its Indian heritage, to express under Indian conditions and in Indian forms the spirit, the thought and the life of the Church Universal". The CSI Synod Liturgical Committee has developed several new orders for worship for different occasions. The order for the Communion Service known as the CSI Liturgy has been internationally acclaimed as an important model for new liturgies. The Committee has also produced three different cycles for lectionaries for daily Bible readings and "propers" and collects for Communion services. The different orders of service are put together in a Book of Common Worship. In addition, the Committee has also brought out a Supplement to the Book of Common Worship. The Church of South India has been a member of the World Council of Churches from the beginning and is represented in several of its important committees and commissions, particularly in the Central Committee and the. Faith and Order Commission. The CSI also participates in the World Reformed Alliance, the Wider Episcopal Fellowship, the Lambeth Conference, etc. In the constitution of the CSI in 'the section on Governing Principles under the heading: "The Purpose and Nature of the Union" it is said that "in every effort to bring together divided members of Christ's Body into one organization, the final aim must be the union in the Universal Church of all who acknowledge the name of Christ., and that the test of all local schemes of union is that they should express locally the principle of the great catholic unity of the Body of Christ". Because of this conviction at the very first meeting of the Synod of the CSI, it was decided to send an invitation to all other churches in South India for joining in negotiations for wider union. The Baptists and Lutherans accepted the invitation and Joint Theological conversations were started. The Baptists withdrew after one meeting. But the CSI-Lutheran Joint Theological conversations continued and as a result of their recommendations a Joint Inter-Church Commission was set up in 1956, for working out a plan for a united church. This Commission drew up a constitution for a united episcopal church in which the CSI and the five Lutheran churches in South India will come together under the name of The Church of Christ in South India. No definite action has been taken yet for implementing the plan. Meantime the CSI has also had conversations with the Baptists and Methodists. When the negotiations for the Church of North India were going on, there was an understanding that as soon as it was inaugurated the Church of South India and the Church of North India would establish relationships of full communion With each other and start conversations towards union for becoming a united church for the whole of India.